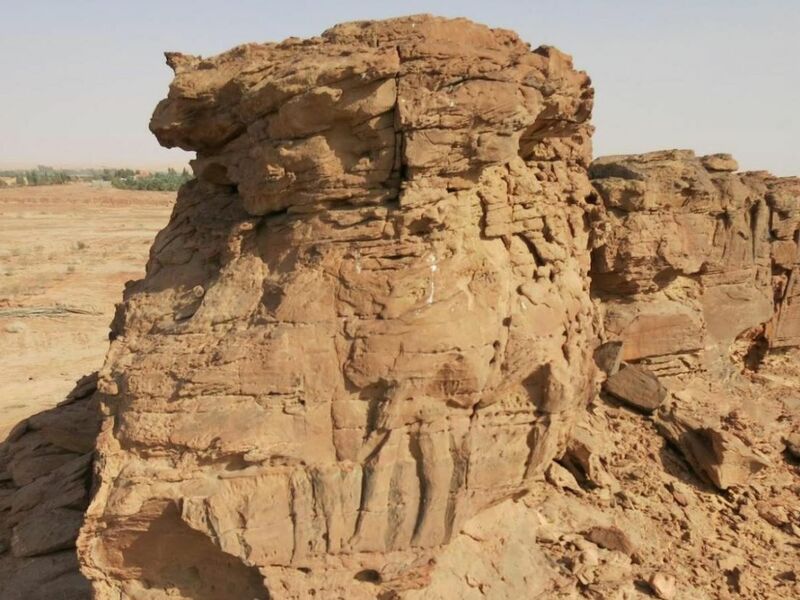 About a dozen life-sized stone sculptures and reliefs of camels have been found in a markedly inhospitable site in northern Saudi Arabia. While camelid art has existed in the region going back millennia, nothing quite like this has been found before. 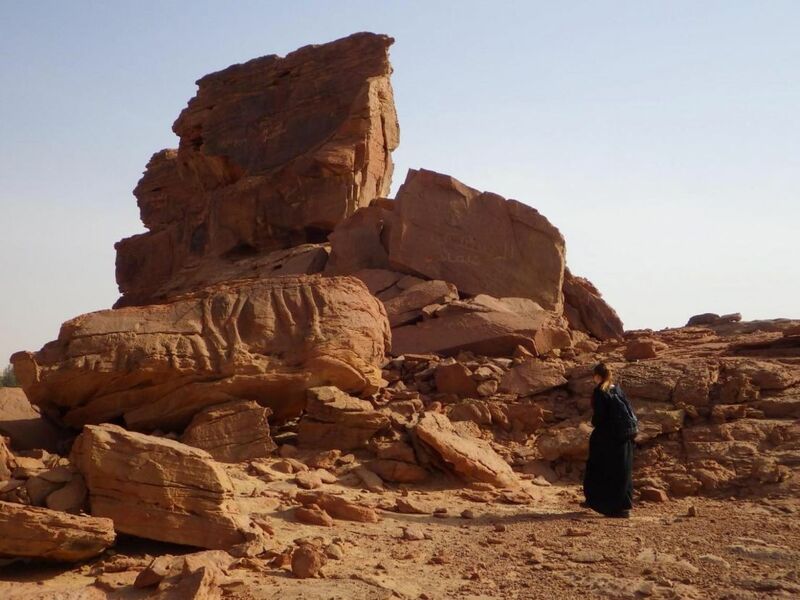 The somewhat eroded statues are tentatively dated at around 2,000 years old, give or take a century or more, according to a collaboration between the French National Center for Scientific Research and the Saudi Commission for Tourism and National Heritage reported this week in the Cambridge journal of Antiquity. The archaeologists studying the weather-beaten "Camel Site" in Al Jawf, a province in northwest Saudi Arabia near Jordan, suggest the sculptures are a facet of a broader Arabian tradition that was probably influenced by the Parthians (ancient Iranians) and nomadic Nabateans from preceding centuries. Why the artists chose to carve dromedaries in stone in such a remote, hostile environment is debatable. Ancient rock reliefs are not rare in the Near East, from Turkey to Mesopotamia. Israel's Negev Desert has thousands of them, which remain undated. But they are rare in Arabia. What rock-cut sites the peninsula does sport usually show scenes of war and hunting, geometric forms – and animals, too. There are no other whole life-size statues of camels comparable with these Saudi ones, though. 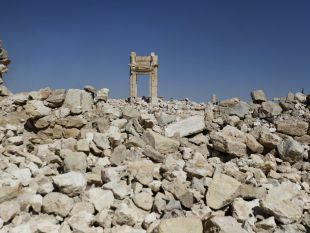 The scarcity of ancient Arabian rock reliefs has impeded the understanding of the function and socio-cultural context of the art, stress the archaeologists, led by Dr. Guillaume Charloux of the French National Center for Scientific Research (CNRS), with Hussain al-Khalifah, Thamer al-Malki, and Romain Mensan. No associated artifacts were found at Camel Site that could give clues about origin – no hammers, picks or anything else. (Around 50 flakes of flint tools were found, but there are no grounds to associate them necessarily with the camel art). 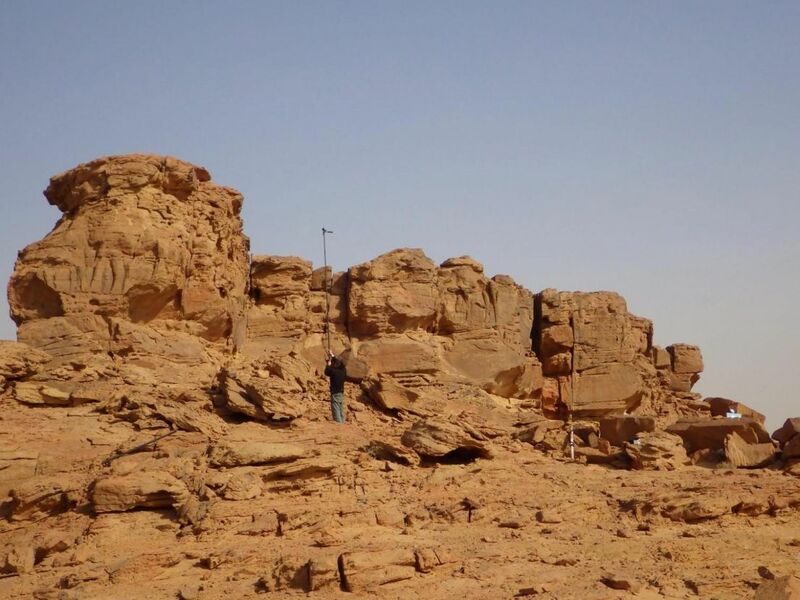 Further complicating the dating effort: Al Jawf's Camel Site is in a privately owned property and has been damaged by modern construction works, the researchers note. Also, the surrounding area has yet to be properly explored. For all the art, Camel Site seems not to have been inhabited. As the authors write, it "does not seem propitious for permanent human settlement." However, they point out, the fact that "this isolated and seemingly uninhabitable site attracted highly skilled rock-carvers is striking testimony to its importance for surrounding populations." For instance, it might have been a place of veneration going back generations (for what it's worth, the camel was one of the animals supposed to be sacred to Al-Lat, a goddess worshiped in the pre-Islamic pagan era through the Arabian peninsula and beyond). Or the site could have been a boundary marker. Or a rest stop for caravans. Or perhaps, the art represents something the maker found beautiful. 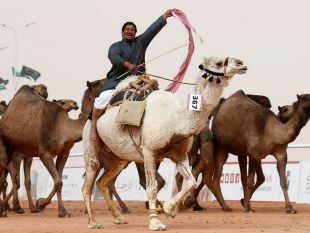 Camels made headlines just this January, when 12 contenders were kicked out of the annual King Abdulaziz Camel Festival beauty contest because, among other things, the owners had injected their faces with Botox to make their pouty lips more alluring. Perhaps camel appreciation goes back longer than we realize. The camelide and the other sculptures were carved on three rocky spurs. What the 12 panels and reliefs show takes some interpretation, as erosion partly destroyed some of the depictions, as well as any traces of tool-work. Yet despite the wearing by time and modern vandalism, the researchers could identify at least 11 camels. Some are shown alone, some in trains and some meeting other animals. Two equids of indeterminate species are also shown. One distinctive scene shows a dromedary meeting what seems to be a donkey, an animal the ancients of the Middle East did not normally celebrate in art. In any case, say the researchers, the artists were faithful to their source and had a well-developed aesthetic sense. The camels were carved in proportion. Muscles and heads, particularly the muzzles and eyes, and the thickness of the legs were individual. These were lovingly depicted camels. Arabia is where camels are thought to have first been domesticated. Yet the animals carved at Camel Site seem to be shown behaving as they would have naturally, without harnessing. That said, the archaeologists think one or two of the camel carvings may have shown rope. Lastly, some of the sculptures are high enough to have required scaffolding ("or at the very least, a system of ropes," observe the scientists). Great effort went into these things. But how did the archaeologists reach the conclusion that they had been carved around 2,000 years ago, very roughly speaking? In contrast to popular wisdom, the camel did not originate in the Sahel or Levant. They apparently evolved in North America around 45 million years ago. From there they spread to South America (becoming alpacas, llamas and so on), Asia, and Africa some time in the Pleistocene, say the archaeologists. That isn't saying much, as the Pleistocene spans about 2.5 million years to 11,000 years ago. A 2013 paper by Richard Jennings et al, also published in Cambridge's Antiquity journal, argues that Arabian rock art from the Neolithic onward was typically found by paleo-lakes. There is plenty of evidence, including cores from the nearby Dead Sea, that the prehistoric Saudi Arabian environment of around 10,000 years ago was more humid (now Camel Site is hyper-arid). Rock art drawings of animals indicate that they probably abounded in the area then. However, these paleo-lakes and the Saudi rock art depicting ibexes and even leashed dogs apparently predated the camel art by thousands of years. 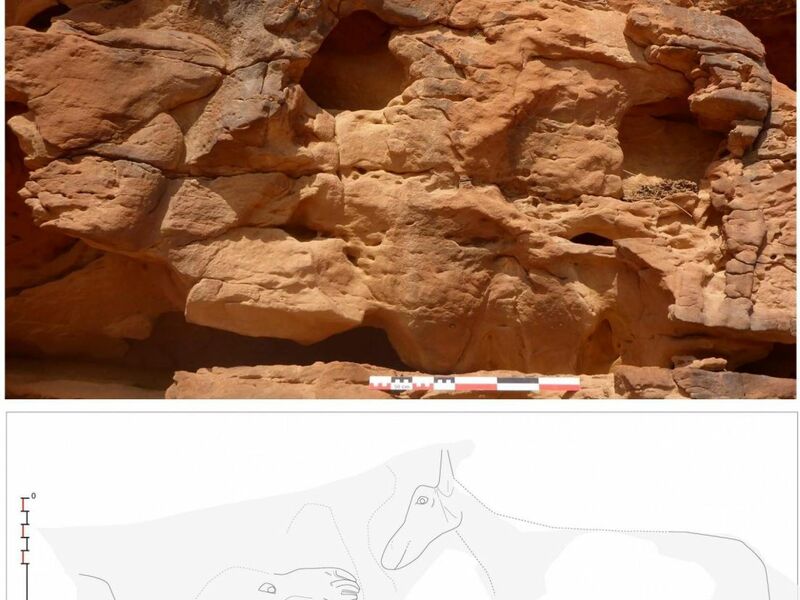 In contrast to other sites of rock art in the Saudi desert, no artifacts were found here that could help date Camel Site, which was explored in 2016 and 2017. Also, patination (formation of a mineral film) and erosion have almost entirely destroyed the tool marks. The authors acknowledge that absent associated artifacts, dating was tricky, and suggest that validating their tentative dating may require micro-erosion analysis, which hasn't been done yet. What they could do meanwhile is compare the stone camels with stylistic and iconographic parallels in the region. One snag is that the Camel Site beasts are depicted in a unique style, from head to hoof. But they do bear some similarities to Mesopotamian representatives of animals created in the early centuries C.E., write the archaeologists. Palmyra for instance had been famed for camelids in its gorgeous reliefs, at least until ISIS destroyed the Iraqi city's pagan treasures in late 2016-early 2017. Another example is naturalistic camels depicted in Hatra, Mesopotamia. A sculpted deer head found at the same site looks a lot like the Camel Site animal the researchers think is a donkey, they explain. The answer may lie in Nabatean art. The desert nomads were masters at making rock-cut monuments, including large-scale animals, in the very sort of low and high relief found at Al Jawf. Examples of their art exist at Petra, Jordan, where the Nabatean residents carved a host of beasts including, markedly, the camel. 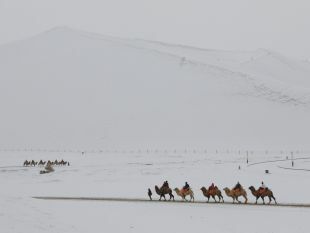 The Camel Site images are too eroded to be technically compared, they admit, but both sites feature a procession of camels. Finally, the researchers note that the region has a history of life-size camel engravings, if not as elaborate as these. Naturally-positioned camelids appear in northwest Arabia, and in Wadi Rum in Jordan, for example. Again, dating these artifacts is a problem. 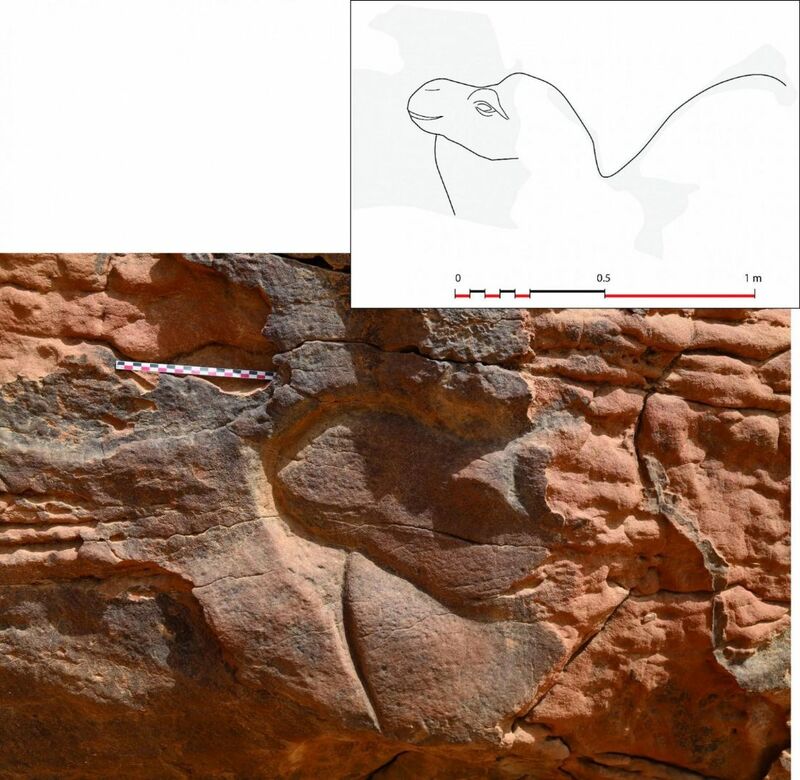 In short, the researchers found a bunch of stone camels so eroded that the tool-marks are gone, any tools that had been used are long gone too, they can't tell why anybody would want to carve them in the middle of particularly onerous desert conditions in Saudi Arabia, their age is uncertain – and camel art seems to have been around since almost as long as the camel itself. They think these images may be about 2,000 years old, with a wide margin of error. Ultimately, these are magnificent depictions of camels made in the dim reaches of history and we can but admire the skill of the long-dead artists, and hope that more exploration in this now-desolate area uncovers fresh clues.